Your application and documentation will be screened by a caseworker. and notify you by phone or mail of a date and time of your appointment. Should your case be denied, you will be mailed a denial letter. information will result in your application being denied or returned to you. payments, unemployment, workmen’s compensation, etc. work with Texas Workforce Center. verification that you have registered for work. Have you ever used another name? If so, list other names you have used./¿Ha usado alguna vez otro nombre? Sí es el caso, enumere los nombres que ha usado. Home Address, if different from above. If it is rural, give directions. / Domicilio particular, si es diferente a la dirección de arriba. Si es rural, explique cómo llegar. acerca de todos que viven en la casa con usted, los considere miembros de la unidad familiar o no. 2. What is your household's county and state of residence (where you make your permanent home)? ¿En qué condado y en qué estado viven (tienen su hogar permanente) usted y las personas de la unidad familiar? Do you plan to remain in this county and state? Check all boxes that apply to your household./Marque todas las cajitas que se apliquen a su caso. 4. List your average monthly household expenses./Enumere los gastos mensuales de la unidad familiar. Does anyone pay these household expenses for you? 6. Are you – or is anyone in your household – pregnant? 7. Are you – or is anyone in your household – disabled? 8. Have you – or has anyone in your household – applied for SSI or SSDI? If Yes, who applied and when? 9. Do you – or does anyone in your household – have unpaid health care bills from the last three months? 10. Do you – or does anyone in your household – have health care coverage (Medicare, health insurance, V. A., Tricare, etc.)? 11. How much money do you have? For example, on your person, in your home, in bank accounts, or other locations? 13. Do you – or does anyone in your household – own or pay for a home, lot, land, or other things? 14. Did you – or did anyone in your household – sell, trade, or give away any cash or property during the last three months? 15. Have you – or has anyone in your household – worked in the last three months? personas; los ingresos del patrocinador; becas o préstamos de la escuela; manutención de niños, o pagos por desempleo. ¿Con qué frecuencia lo recibe? true and correct to the best of my knowledge and belief. to prove statements about my eligibility. or termination of health care assistance. las preguntas, son verdaderas y correctas. información necesaria para comprobar mis declaraciones sobre la elegibilidad. • Solicitud de SSI, TANF, o Medicaid o la entrega de cualquiera de estas. terminación de asistencia de atención médica. cualquier tercero el costo de los servicios médicos proporcionados por el condado. cualquier otro fuente de pagos por mis servicios médicos. BEFORE YOU SIGN, BE SURE EACH ANSWER IS COMPLETE AND CORRECT. ANTES DE FIRMAR, ASEGÚRESE DE QUE CADA RESPUESTA SEA COMPLETA Y CORRECTA. esposo o esposa también firme esta Forma 100, aunque no tenga derecho de recibir asistencia. 3.) Answer as many questions as you can on this application. 3.) Conteste tantas preguntas que pueda sobre esta solicitud. legal documents, statements from persons giving you money. hipoteca; la licencia para manejar de Tejas; otra identificación oficial. estado de cuentas del banco. seguros, papeles de la corte u otros documentos legales. of information will not affect your eligibility. cost of health care services provided by the county from any third party. derecho de recuperar el costo de servicios de un tercero. plazo de 14 dias para determinar su elegibilidad. application for or receipt of Medicaid, TANF, or SSI. personas que viven con usted, o si solicita o recibe Medicaid, TANF, o SSI. 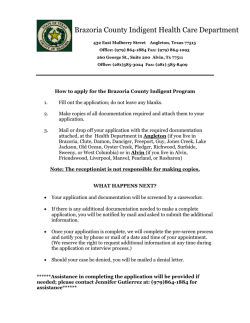 guidelines to receive services through the Brazoria County Indigent Health Care Program. Clients will be terminated from the program for repeated non-compliance. alcohol abuse, if not currently and actively participating in a supervised rehab program. referral for you to see that specialist. Brazoria County CIHCP will not issue payment for any nonemergency services provided without a referral from the Brazoria Co. Primary Care Group). may be held responsible for the hospital bill and all related emergency room physician/lab bills. County, including full payment for prescriptions exceeding 3 per month. County Indigent Health Care Program and for informing these providers of our billing address. them the above information so they can bill our office. receipt of SSI, TANF, or Medicaid. you became ineligible or you may be subject to prosecution under the Texas Penal Code. person would also be subject to the criminal sanctions set out in Section I.
of the property or services taken. need not be limited to the criminal authority provisions set forth above. please tell this office and we will be happy to assist you to the appropriate authority. I have read the forgoing letter and understand its contents. for the Indigent Health Care Program. health services. 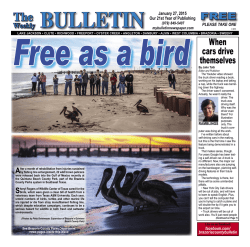 I know and understand the Brazoria County Indigent Health Care Program Fraud Policy. not reapply I would lose any benefits I might have been receiving. I have read all of the above and I understand it.